While deciding on the sentiment, I looked through my stash and found that the SRM Stickers (Faith sentiment) seemed to be perfect for this design. Since a Star is one of the celestial bodies, I think this sentiment reminds us of God's power. No matter where you are at in your life stages, we are all faced with everyday challenges and sometimes serious life issues. 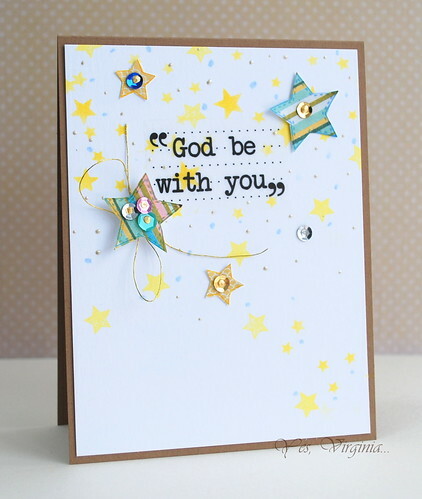 I hope this sentiment reminds you that "God be with You"! I am glad that the Ombre Challenge over Avery Elle is coming to an end as I can't stop making cards for this challenge. The ideas kept coming up in my head...so today's card is my last entry. You can see my previous ones here and here. I did some masking and kept the design one layer. I then embossed the sentiment in gold and stitched some sequins with gold string....got to have a small wow factor, right? Also, there is an announcement about the new monthly sponsor over Virginia's View Challenge, you can see the details here! Hello, it brings me great pleasure to share a card with you today. 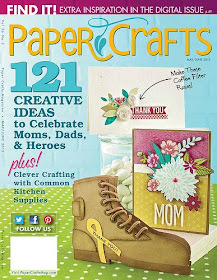 I am the guest designer for Mariana's March Challenge in her blog. I have combined a few techniques for this card--kissing, stenciling, layering and embossing (on the birdie). 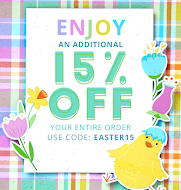 Hope this card makes you feel that Spring is truly here! 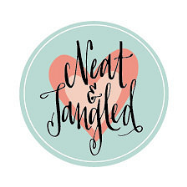 I would love it if you stop by Mariana's blog as she does beautiful and detailed work! Call me crazy...but after posting yesterday's card (see here), I decided to give it another go for the Ombre Challenge with the same Avery Elle stamp set (my one and only) To the Point. Sometimes I just love to do these sort of things...no reason. I just love creating and give my brain a little work out. I embossed the banners in white and masked off the border and applied Distress inks. After that, I flicked some droplets of water. I add the gold stitching and sequins. Voila! Well, it was a lot of fun! After that, I decided to make two quiches! 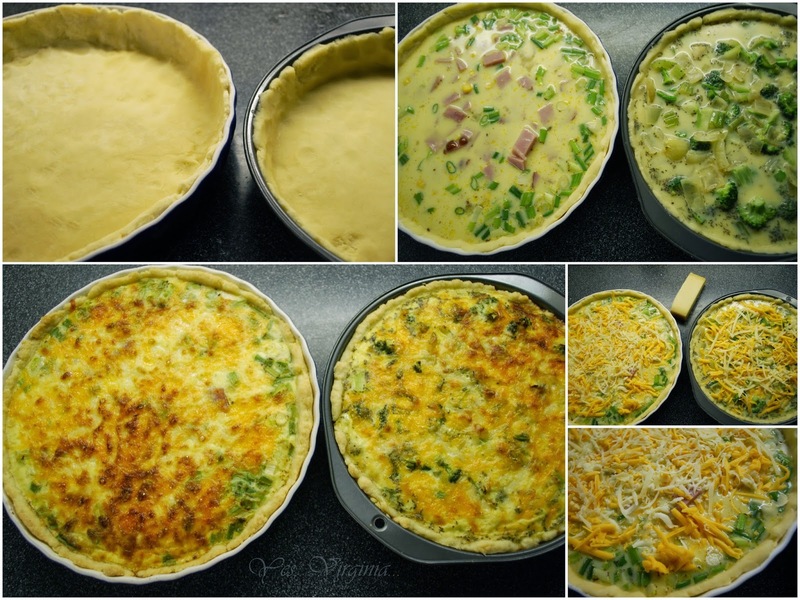 Ham and Cheese Quiche (left) , Quiche Lorraine (right). 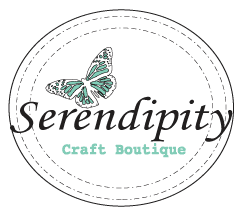 I am feeling very blessed to be able to do what I love and to have this blog to share my creations with you. When I wrapped up the first Virginia's View Challenge #1, I couldn't believe how March just flew by so quickly! I am eagerly waiting for the arrival of April. We have two family members celebrating their birthdays! And of course, Virginia's View Challenge #2 is just around the corner! It's the little things, right? 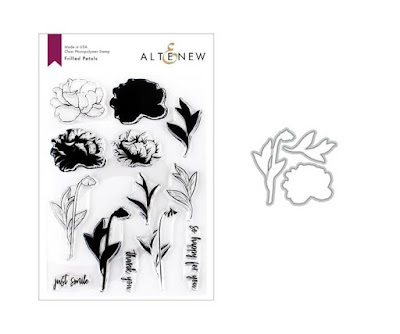 When you have limited stamp sets, you get more creative...agree? It's a lesson from my earlier stamping days. I had very few sets of stamps ( I started out with just two sets or so) and sometimes for certain challenges, you HAVE to use the stamp company's stamps to play (it was Hero Arts, in my case). I think I used the stamps to the max and made some weird funny cards. They look hideous to me now, but I am glad those exercises prompted me to be a more creative stamper. I stamped the small solid arrow images from darkest to the lightest. That was kind of fun. Then I applied various shades of orange with Distress Inks to the diecut and created a sun-like design. I also looped some gold strings around (for good measure) and added a few sequins. 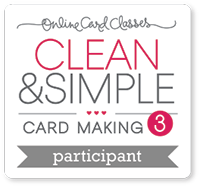 I am sharing a card that I made from taking the Clean and Simple online class. 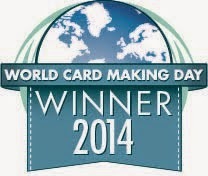 The Day 11th class from Julie Ebersole inspired my card today. In Julie's video, she did a Bokeh effect and was so fun and simple to do. So I tried my hands with a similar design, but I added my own twist. In Julie's card, she did the clouds and sunshine-themed card. Here I made a rain-themed design. The stamps are from Fresh Squeezed Stamps called "Weather Through". Sadly, Fresh Squeezed Stamps is closing its shops and only a select few are left. You can see the details here. I had fun stamping the raindrops with the Bokeh Effect. I also added a thin strip of glitter on top (much like what Julie did in her video). I colored the image with water and Distress Inks. The umbrella was gold-embossed after the coloring. 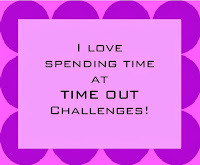 I am entering this card for the current Time Out Challenge (details here). The theme is "Dancing in the Rain". How fun is that? There are still time to enter the challenge! 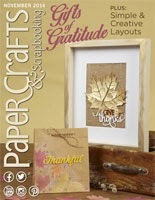 Today is my turn to share my projects over CAS-ual Fridays Stamps Blog. This set "Casual Comfort" is gorgeous and versatile! Isn't this set delightful? I did white and red embossing and the navy blue was stamped! 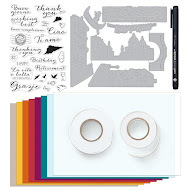 Hope you can leave me your feedback over CAS-ual Fridays Stamps Blog. The comment feature in this post has been turned off. 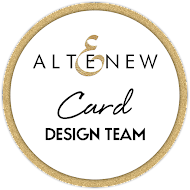 Have you ever tried to design a card and it went to a totally different direction as you had previously envisioned? Well, today's card is exactly. just. that. I was inspired by Day 11's Clean and Simple online Class. After seeing Jennifer McGuire's video on "Layered Stamping", I was itching to try the technique. Namely, to stamp white pigment ink and then stamp a solid stamped image over...well, mine didn't turn out as planned. I stamped Tweed Pattern in Colorbox Dye Ink for the background. It barely showed anything! You can hardly see the Tweed Pattern on my solid stamped image (using So Kind set)...what a let down! This is my unexpected result. I happened to have the new diecut ( All Seasons Tree from Simon Says Stamps) sitting in front of me...the rest is history. What do you think? This card came out from a "mistake"! Guess it is not so bad after all. Just catching up with some class work for the Clean and Simple Online Card Class.... I was inspired by Day 8 class taught by Dawn. I hardly use colorless blender copic marker. This technique helps to give shades for the stamped image. 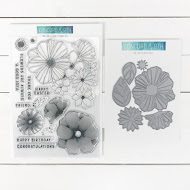 With an oval diecut, I stamped the flowers over, then I highlighted the petals with the colorless blender. I made this card in the wee hours....I wasn't sure if the stamped image looked "right". But you get the idea.. I did a wrap-up over Virginia's View Challenge. If you haven't stopped over there, here is the link. I am continuing to share my class work from the CAS Class. I was inspired by my Runway Inspired Challenge team mate Tasnim! She is one of the guest designers for this class. Tasnim's video in this class reminded that I should definitely get those gel pens out to play. I have let the gel pens sit in my pen holder and collect dust. I almost never used them! I didn't quite apply my techniques like Tasnim did. But I did take out the stamps set that Tasnim designed herself and use. that. gel. pen. By the way, you can see another stamp that she designed here. Tasnim's rose set is a three- step stamping and has so much depth and details. With the gel pen, it definitely highlights the petals and adds a wow factor to this one layer card. Thank you, Tasnim, for the stamp set and inspiration! You are SO talented! I have a card to share over Virginia's View Challenge. Can you guess what technique I used? Welcome to the latest Runway Inspired Challenge! From the first look of this runway photo, I found it a bit daunting. But with some careful observations, I think I managed to make a decent one. The elements from the model's skirt seem very detailed and intricate. I took out the stencil (from Night Flower) and did some masking. Then I copic-colored the stamp (also called Night Flower from Hero Arts)....before you know, they fit! Be sure to check out my design team mates work and be prepared to be wowed (see here). I hope this inspires you to play the challenge! I can't wait to see what you create! On a final note (not craft-related), I am excited to share the news that my daughter Stephanie and her "Stand up to Stigma" teammate Kristin are currently in Toronto. They are on the finalist for winners at the celebration event at the Centre for Addiction and Mental Health on 18 March 2014. This is tremendous! 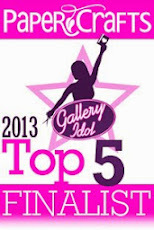 On behalf of Stephanie and her team, thank you so much for your support/votes! Edited----> (12:20 pm) Breaking news: Stephanie and her team won $1000 for the 2nd prize! You can see the official announcement here. Wow!!!!!! Hello, friends! 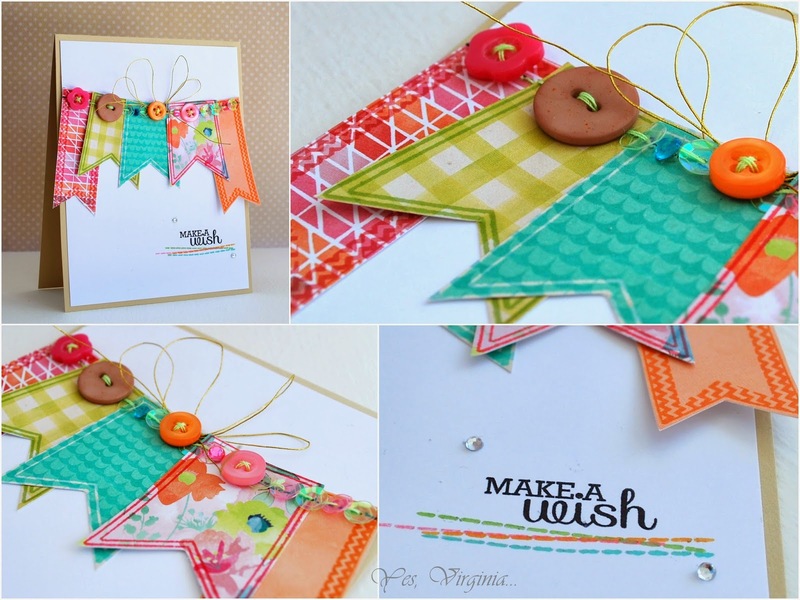 I was going to enter my card for Avery Elle's Challenge (Embellishments) and I just found out that I missed the deadline! Boohoo! However, this challenge still provided me the chance to play with some new -to-me goodies : Avery Elle Stamp set To The Point and Basic Grey paper (Fresh Cut). I have decided to share the card and may as well enter the challenge here instead. One of my favorite things to do is stamping on pattern paper. It provides you instant gratification and enjoyment! 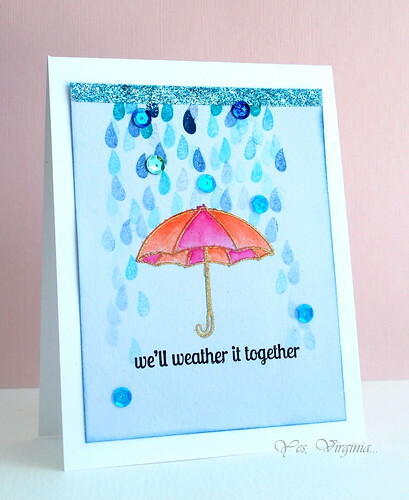 I had so much fun adding the embellishments to this card. It's been a while since I added gems and buttons to cards. The sequins really took over the embellishment department these days! edit: This card is also featured here in CARDS blog. Yay! 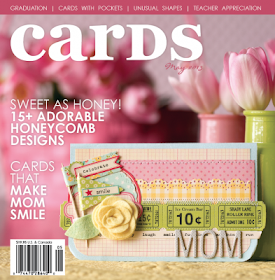 I was the lucky one to meet my card-making idol Laura Bassen while hubby and I visited Chicago last October. Laura is just as sweet as she is on her fun and creative videos...in fact, she is even sweeter in person (if that's possible)! 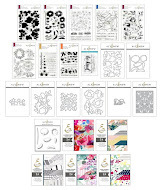 Since I am taking the Clean and Simple On Line Class and Laura is one of the designers/instructors....of course, I am totally inspired by her! Laura is well-known for her amazingly mad masking skills and gorgeous rainbow palette. 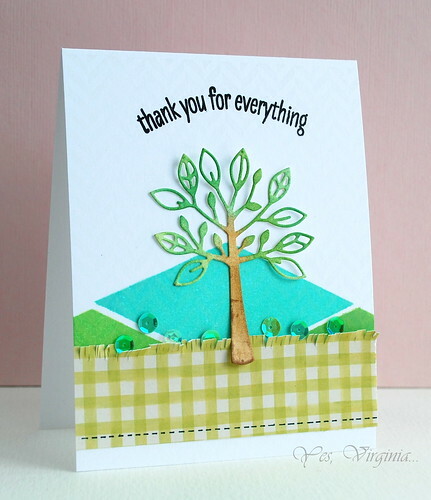 In this CAS class, Laura worked her magic with masking tape and created a beautiful plaid card. I decided that I would channel my "inner Laura" to create a one layer card by using one of the Spellbinders Classic Triple Scallop that Laura generously gifted me. I made the diecut and used both positive and negative sides to create this fun pattern. The sentiment is from CAS-ual Fridays new release called "Wait for It". Here was my initial attempt. I was not pleased with the overall masking because I let the tiny white space show through. I was utterly disappointed with myself ! But then after examining the "boo boo" some more, I kind of liked it! So I decided to leave a small white margin between each scallop in my 2nd try (see above). The weather has been bleak and cold here in my area. Winter doesn't seem to want to leave! Spring seems to be just a rumor !? 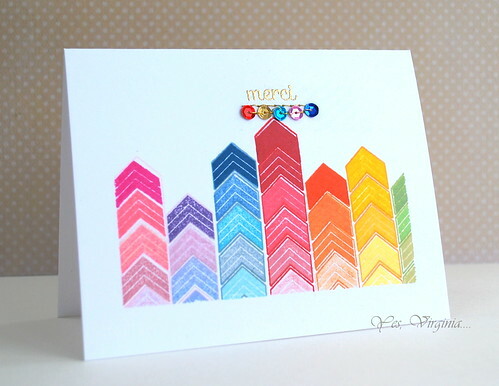 This colorful card definitely provides me a needed dose of sunshine. Thank you, Laura, for being such an AWESOME friend! I hope you can bear with me to see another card with water-colors! Last Saturday, I played the Scramble Challenge over Hero Arts Flickr Group. 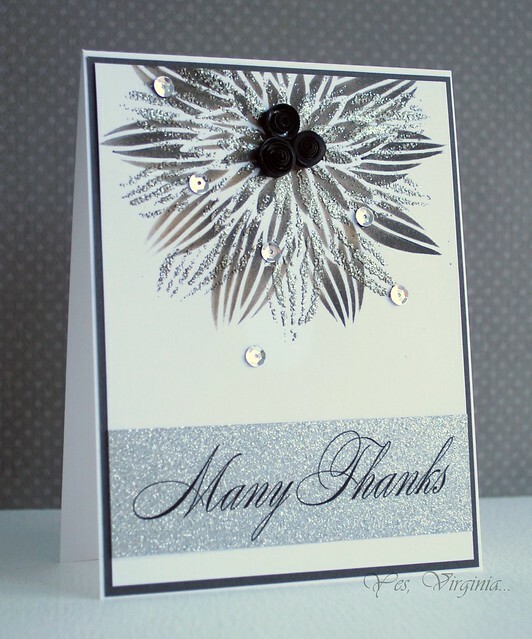 The theme was to create a card mainly in neutral colours (white, cream, black, grey, kraft etc.) and that it has a dash of at least three other colors to it (details here) . This was my result. For the water-color background, I applied three Tim Holtz Distress markers on the surface (over the black-embossed image) and spritzed the surface with water. It's a shame that I only have those 3 Distress markers...The sentiment is from SRM Sticker. I used a piece of cork to add interest and textures. Have you played with water-colors? Virginia's View Challenge is still going on ( 5 more days to enter)! This challenge blog took off beyond my wildest dream. From setting up to getting monthly sponsorship (who believe in me and this challenge blog), I can't believe how easily it all came together. 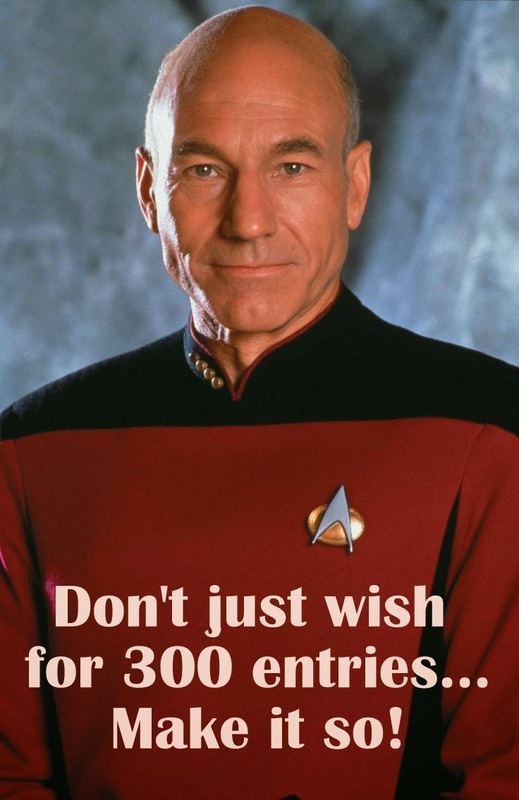 Without your support, I am nowhere near what it is (232 amazing entries and counting ). I am working on next months' V. V. Challenge theme...here is a sneak peek! edited: I got a comment today over Facebook!! "WOW! You have over 200 entries and yet took the time to not only comment on my blog but READ what I wrote!!!! Now THAT is AWESOME!!!!!! Thanks a ton!!!! You've made me a faithful! " Thank you, Kelli Arkell Hull! My reply: "Thanks for the MOST encouraging comment. I try my best to give EVERY participant the well-deserved blog love. Since I can not give everyone a prize, this is the least I can do. And I do it with love and admiration. Your comment totally makes my day!" Hello, friends! We are in the Day 3 of the new release over CAS-ual Fridays Stamps! This set called "Wait for It" is uber. cool.! There are SO many great sentiment in this set. I had a hard time deciding which one to use. I finally saw this "wicked" sentiment and was really intrigued by it. I made a kind of a WILD card :) I did some orange water-coloring (Ripe Persimmon and water mixture). 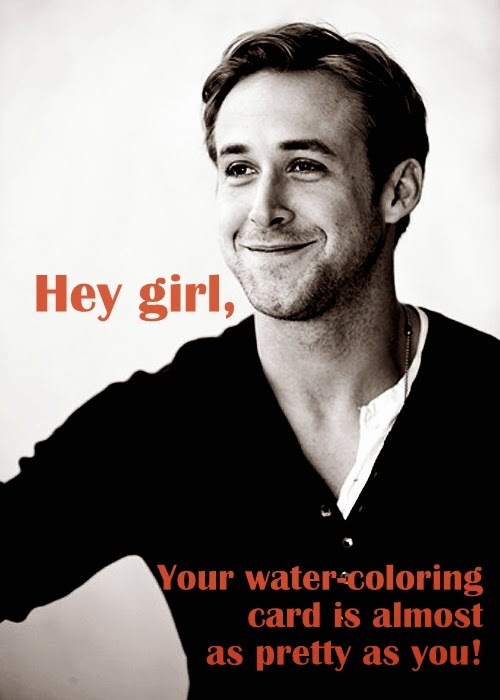 See all the "drama" that orange water-coloring created? I sure hope you can check out CAS-ual Friday's new stamps and while you are there, make a comment! You might just win some new stamps!? Hello there! We are into Day 2 of stamps release over CAS-ual Fridays! 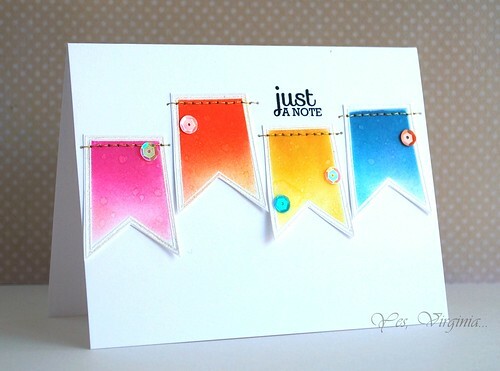 It is so exciting to work with matching stamps AND dies! The new stamp set called" Casual Comfort" has some intricate leaf designs. They are perfect for layered stamping! So instead of use a few types of green, I decided to emboss some and stamped some. And that's not all...check out these Fri-dies! Aren't these intricate flowers and stems gorgeous? I took very little time to make them. First I started off with a piece of thick white card stock and made a few die cut, then I copic-colored the flowers and stems. I added Glossy Accent on the tiny flowers, let dry. Assemble. Done! What do you think? Please head over to CAS-ual Friday's Stamps and check out all the beautiful samples my talented DT mates have created for you! 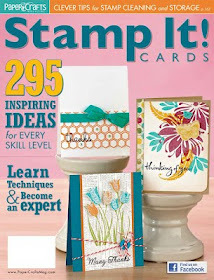 And did you know....CAS-ual Fridays Stamps is the sponsor for this first Virginia's View Challenge? Yippee! !You can find out all the details here! It's an exciting day over CAS-ual Fridays Stamps! The first set to kick off this release is called "Clover"! 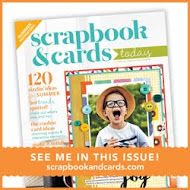 Hope you stop by CAS-ual Fridays Stamps and check it out here. 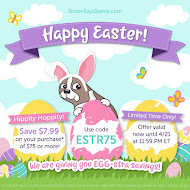 Make sure you comment and perhaps you are the lucky one to win some new stamps!!? 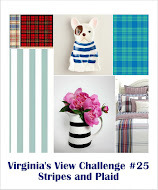 Lastly, here is an update on Virginia' View Challenge, you can find out all the happenings here. We have video links and guest designer feature. There is still lots of time to enter the challenge! 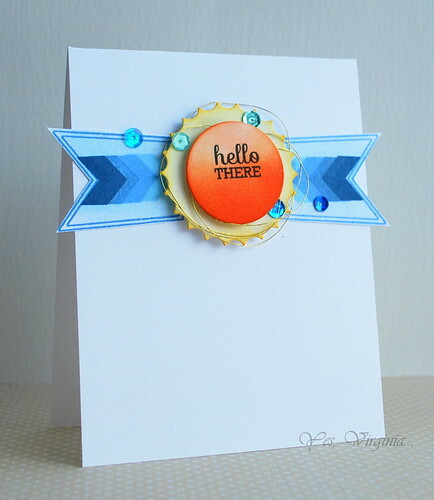 Over at Virginia's View Challenge, we have our first guest design Jennifer Rzasa. Jen painted the butterfly ....isn't it stunning? For all the details of her card, be sure to visit here. With the help of this Penny Black Butterfly diecut (Delicate Wings), this design just came together so easily. 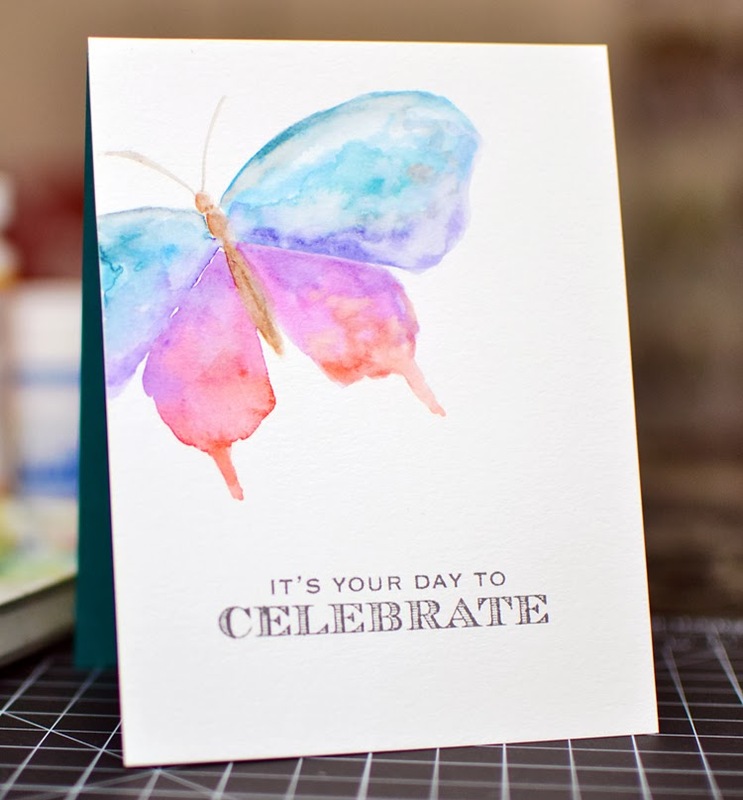 I started out with a white piece of water-color paper and just created a background inspired by Jen's butterfly. After drying it with the heat gun (I was too impatient to wait for it to dry), I made the butterfly die cut. I used a piece of vellum and did some ink splatter to add some interest. The sentiment is from SRM Stickers. At the end, I added the white strings and sequins...done! ....I have you in my life. I made this card a while ago. It is a publication reject. The water-coloring is not perfect, but I like it. I want to thank those who left me the kindest comments, offered support and feedback, and made cards for my new Virginia's View Challenge. As I type this, we have 157 "likes" over Facebook, 63 followers and 97 entries! The challenge blog was born 6 days ago! 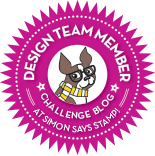 I am working on getting prizes and new features for this challenge blog and so far it is very promising! I feel like I am hosting a super fun party and you are all part of it! And at the end of each party, I get to give out a prize! Please help me spread the word and share links! I'm so glad I have you in my life. Welcome to Runway Inspired Challenge! Isn't this dress stunning? I would not dare to attempt to wear something like this, but I sure can make a card inspired from this runway photo! I took the glitzy and metallic inspiration and just ran with it....here is my interpretation. I used stencil (Night Flower) with the darkest Distress Inks that I have to create the image. And then I turned the stencil at a slight angle and did some silver embossing (with the help of an embossing stick like this one here). The silver embossing powder that I have is rather coarse. In turn, it gives the card a textured look. I added a strip of silver paper with SRM Sticker, this card is almost there. For the final touches, I added my own black quilled circles and sequins. It feels GREAT to have the idea and execution coming together as you had envisioned! I hope this inspires you to play the challenge! I can't wait to see what you create! Thanks for stopping by!